Recently we attended our grandson Benjamin Schuck’s Senior Recital, performed on a grand piano before a full house. It was a summit he reached after 11 years of spending time each day at the piano or keyboard. The program had his name at the top and included a story he wrote about his musical journey. He had composed an original piece, Toubaki Petals, so his name was listed with some famous composers, like Faber, Chopin and Glass. Other kids performed, including our other grandsons, Solomon and Jonathan. We were so proud of them. However, it was Ben’s night. And Elizabeth’s. The event made me think of where the music began in the Schuck family. While my husband’s father, Clements, was known as a musician, perhaps it was his mother Elizabeth Geffre Schuck that taught him how to play in the first place. My only memory of the first Elizabeth Schuck (her daughter-in-law and a granddaughter were also named Elizabeth) was after Larry and I were married. She came to the farm for Easter dinner and gave each of her grandchildren a small gift of money, including me. She died a few months later. Elizabeth lived most of her life on the windblown Dakota prairies. As a married woman, she hauled pails of water to the house to cook and wash clothes, worked in the fields and milked cows. When her husband left, she moved to a little house in Aberdeen. In the midst of that hardscrabble life, she fostered beauty. Her wedding dress was fit for a princess. She also did fine needlework, and Larry and his sister recall that their faith grew when they stayed at her house. However, it was her music that was passed from generation to generation. Elizabeth had a piano in her farmhouse, and she taught her son Clem to play. Along with the piano, he played saxophone, accordion, and organ. He played in a church band, and for a time traveled with Lawrence Welk’s band. 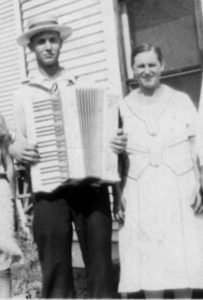 Later, while raising 12 kids and managing a farm at LaMoure, N.D., Clem had a lot to deal with, but at the end of the day, he’d let go of his worries by sitting at his Wurlitzer organ and filling the house with waltzes and polkas. Like his father, Larry likes to play music in the evenings, although his instrument of choice is the guitar and his music is 50s and country western. He’s played in church bands for decades. Our sons took piano lessons, played sax and clarinet in the school band, and one played bass in a church band for years. At the recital, the talent displayed by Ben and his brothers would have made Elizabeth proud. It certainly made his parents and grandparents bust some buttons. There are some lessons to learn from this this simple woman of the prairie. Elizabeth taught the gift of music, stitched beauty with her own hands, passed along her faith, and was generous to her grandchildren. Maybe for all of us, it’s enough to follow her example, plant good in the lives of others and leave the rest in God’s hands. Note: Elizabeth likely never met my grandmother, Bessie Kloubec Muir, however they were contemporaries, born in 1887 and 1888, respectively. Both moved to North Dakota and married in 1907. Bessie died in August 1966 and Elizabeth a year later. Because Bessie’s son documented so much of her early life, I ended up writing a historical fiction story about her called Secrets of the Dark Closet. August 23. Fargo Barnes & Noble from 6-8 p.m. Local/Regional Author Event. Here’s your chance to browse the store, meet several local authors and purchase signed copies of By the Banks of Cottonwood Creek or Secrets of the Dark Closet. September 13. A special presentation for the Christian Women’s Club Brunch Group at 9:30 a.m. at the Eagles Club, 323 N. 26th Street, Bismarck. For reservations call 223-2177.